Total Security Solution provides the most effective defence against virus attacks, denial of service, intrusion prevention, and ransomware. With that comes full and complete visibility reporting at no additional charge. These solutions are easy to set up, easy to manage, with the highest performance, and a clear winner in affordable network security. How and where do you want to deploy your WatchGuard network security solution? What security services are important to your implementation? Do you have a requirement for Secure Wi-Fi at one or more of your sites? Simplicity is our mission at WatchGuard and that mission extends beyond how the product is built to how it is packaged. While all of the services are offered à la carte, WatchGuard have worked to develop two packages that simplify the decision-making process. The Basic Security Suite includes all of the traditional network security services typical to a UTM appliance: IPS, GAV, URL filtering, application control, spam blocking and reputation lookup. It also includes centralized management and network visibility capabilities, as well as the standard 24x7 support. The Total Security Suite includes all services offered with the Basic Security Suite plus advanced malware protection, data loss protection, enhanced network visibility capabilities, and the ability to take action against threats right from Dimension, WatchGuard’s network visibility platform. It also includes upgraded Gold level 24x7 support. 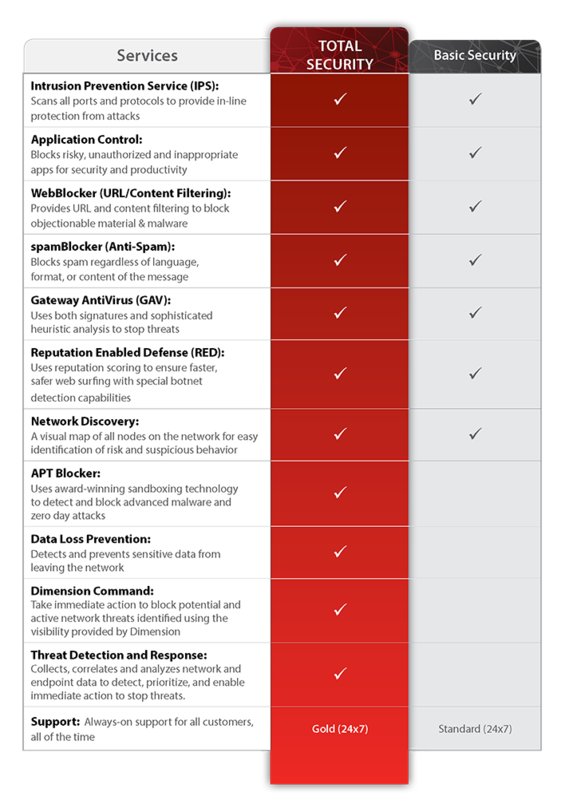 WatchGuard offers the most comprehensive portfolio of network security services, from traditional IPS, GAV, application control, spam blocking, and web filtering to more advanced services for protecting against advanced malware, ransomware, and the loss of sensitive data. WatchGuard also offers a full suite of network visibility and management services.